Congrats on taking the first step to starting your online career! 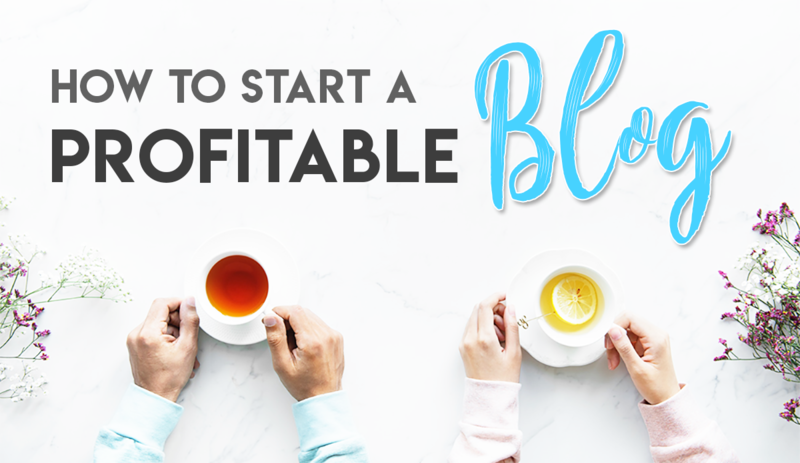 Because we want you to succeed, we’ve included a total of 10 in-depth steps in this guide to show you how to create a profitable WordPress blog by yourself. For a small investment, you’ll be on your way to making an income at home in no time. Domain Name – $14.95 USD per year for most domains. Total cost for your first year of blogging: $14.95 + $47.40 = $62.40 USD. For as little as $5.20 per month, you can kick-start your online career in blogging. Don’t be afraid to make the initial investment, since it’s easy to make much more than you put in and I’ll be here to show you how. Choosing a blog niche is one of the hardest decisions you’ll have to make before starting your blog. Choose the wrong one and you’ll end up wasting a lot of time and money because one day you just might not be interested in writing for your blog anymore. A web host is a company that host’s your website’s files. Choosing the right one is super critical because it will determine the speed, security, and level of customer support for your blog. The web host I recommend for all new bloggers is Siteground because it’s super affordable and it’s the best hosting provider for beginner bloggers in my opinion (I’ve literally tried 5 other web hosts to figure this out). Check out my article on why Siteground is the the best web hosting service for new bloggers. The landing page will give you three options to choose from. Choose the “Startup” option from the packages above. It’s the only package you’ll need as a beginner blogger. On the next screen, it’ll ask you to choose a domain name. Deciding a domain name can be quite difficult so it’s best to spend a bit of time thinking about it before choosing one. You can brainstorm a list of ideas and choose the name you think will best suit your blog if you’ve already found a blog niche. 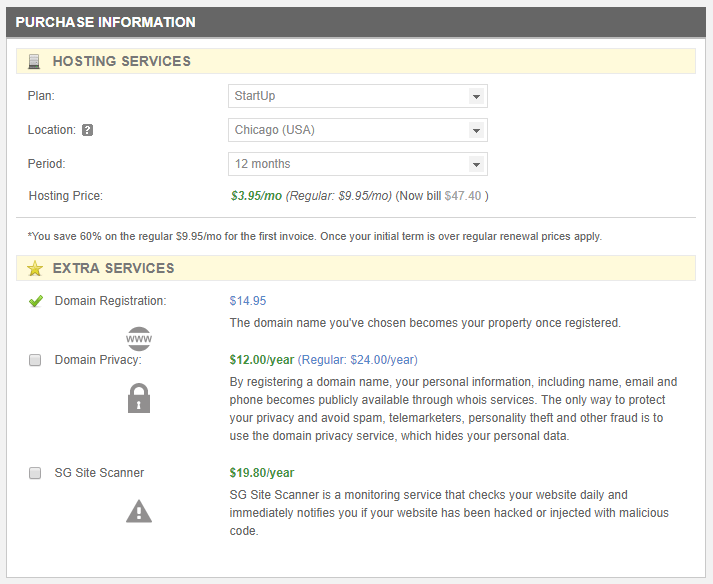 When you’re ready, simply type in the domain you want and Siteground will check whether or not it’s available. In many cases, the domain you want might already be registered. Let’s go over some of the options in the next section. Let’s go over some of the options in the next section. Location: Choose the location that’s closest to your target audience. The closer the servers are to your audience, the faster their connection speed to your site. Domain Privacy: Select this add-on option if you don’t want your personal information to be seen when others search up the details of your site. It’s not mandatory to add this to your site but some people prefer the privacy. SG Site Scanner: This add-on enables an additional level of protection on your site to prevent hacks. Might come in handy if you’re interested, but I’ll have other articles that will show you how to protect your site. After carefully selecting your options, you can proceed to process your payment and then you’ll be able to create your account login information. We’re done the first step! Now we’re onto the good stuff — installing WordPress. 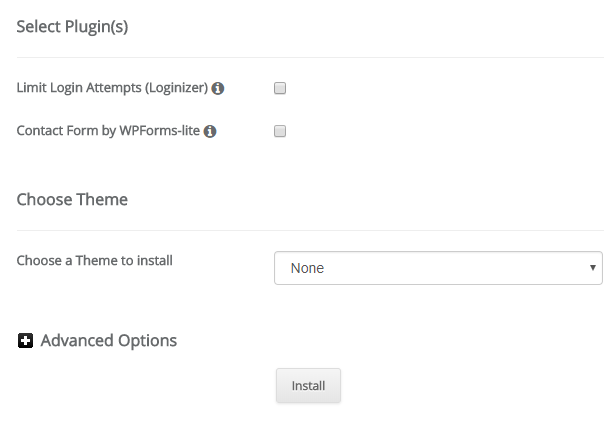 Installing WordPress is easy! On some occasions, Siteground will actually install WordPress for you during step 1. You can check by going to the domain you bought earlier. If it’s installed, skip to the bottom of step 2 to log into your site’s admin panel. In the Autoinstallers section, choose WordPress. Don’t touch the advanced settings and click install. 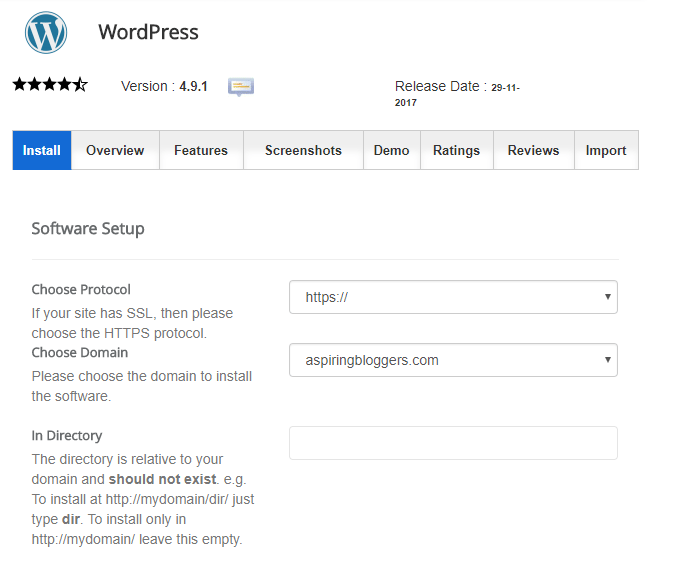 After a few moments, WordPress will be successfully installed on your site! You can now access your site by typing www.yourdomain.com/wp-admin and logging in with the account information you created earlier. Replace “www.yourdomain.com” with the domain you purchased in step 1. This is the admin panel and where you’ll be changing your site’s appearance, and creating pages and posts. Now we’re going to play around with installing a theme on your site. Themes are different layouts you can use to make your blog look just the way you want it. To access all of the free themes that come available with WordPress, go to Appearance > Themes located on the left side of your admin panel. Click on the “Add New” button at the top and then browse until you find the theme you want to be installed on your blog. When you’re ready to install, just hover over it and click install and activate. Voila! You now have a theme installed on your blog. Some premium themes are more expensive than others but it’s a one-time fee so you’ll have permanent access to the themes you purchase and you can even install them on multiple websites that you own. You can find thousands of beautiful themes at these sites so it’s up to you to decide what theme suits your tastes. If you’re having trouble, you can find a site that you really like and then visit What WP Theme is That to identify what theme that site. This only works if the blog is using WordPress and non-custom WordPress theme. For further help with choosing a WordPress theme, read my friend, Marie’s guide on How to Choose a WordPress Theme. This is the fun part! After installing your theme, you get to make it look exactly the way you want! Unfortunately, I can’t show you how to do this part because every theme has different settings when it comes to customizing the design of your site. You’ll have to familiarize yourself with your theme’s settings and other configurations to make your site look exactly the way you want it to. I recommend reading your theme’s documentation files which are included in the downloadable file. Some of these themes have templates that you can install. If you’re lucky, you might even find a theme/template that is perfect right from the start! I find the designing step to be the most time-consuming because even to this day, I’m still customizing the appearance of my site so that it looks better and ultimately performs better. To help your readers learn more about you or to contact you if they need anything, you should always have an About page and a Contact page. Creating these are easy. Just go to Pages > Add New in WordPress. The About page should include information about you (if you’re an individual blogger) or your company (if it’s a blog for your business). If you’re not sure what to write, check out what other people wrote on their websites. You should be able to find a nice structure to use as an example for your own About page. For your contact form, I would recommend installing a plugin called “WP Forms Lite.” This plugin takes away all of the work by letting you create a beautiful contact form that you can put anywhere on your site via a shortcode it provides. Every blog should have a few categories (topics). The categories are up to you! Take some time to figure out what you’re interested in writing about and what you think your target audience will find valuable. Also, make sure it’s related to your niche! 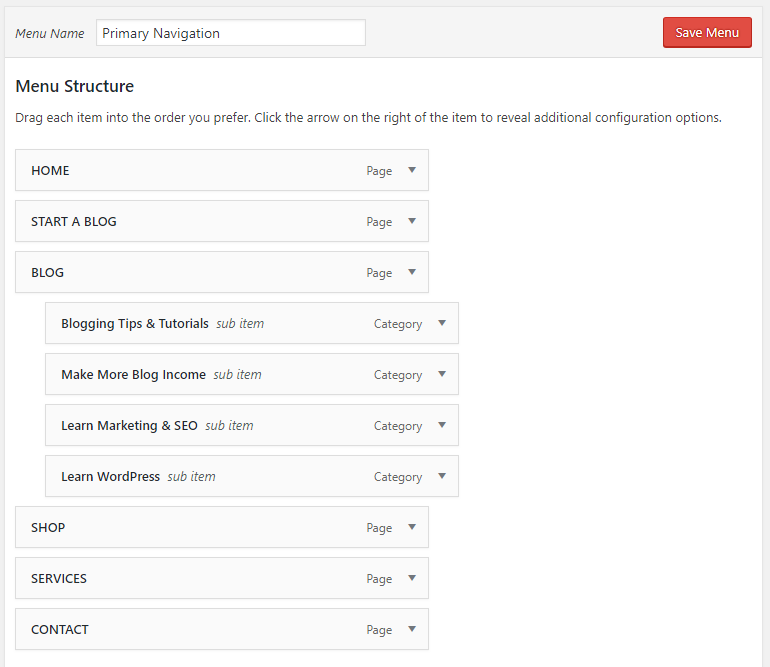 You can create categories by going to Posts > Categories in your WordPress admin panel. After you have some categories, you can add them to the menu bar of your blog by going to Appearance > Menus. On most themes, you’ll have two menus, a primary navigation (header menu) or footer menu. Add the categories to your primary navigation menu. Now that you’ve officially finished setting up your Self-Hosted WordPress blog, it’s time to publish your very first blog article! Such exciting stuff. Articles are essential for making money on your blog. Eventually, some of your articles will be promoting your products, services or affiliate programs. Write as many quality articles as you can because you want to start ranking for keywords on Google and help others find your blog. No content = no readers = no profit. 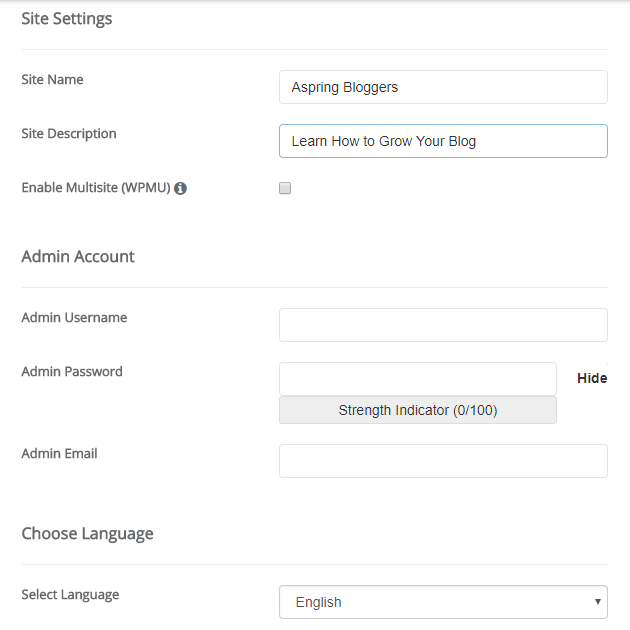 To create an article, on the left side of your WordPress admin panel, go to Posts > Add New to create an article. Be sure to include a lot of pictures and text! A minimum of 500 words per article will help your posts rank better on search engines because it will contain more keywords — words/search phrases commonly searched for. 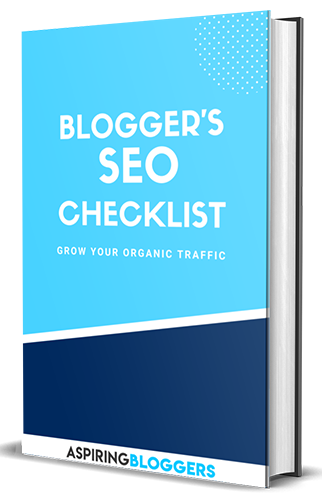 Read The Complete Guide to SEO For Beginner Bloggers to learn more about search engine optimization and how it can help you grow your organic traffic. 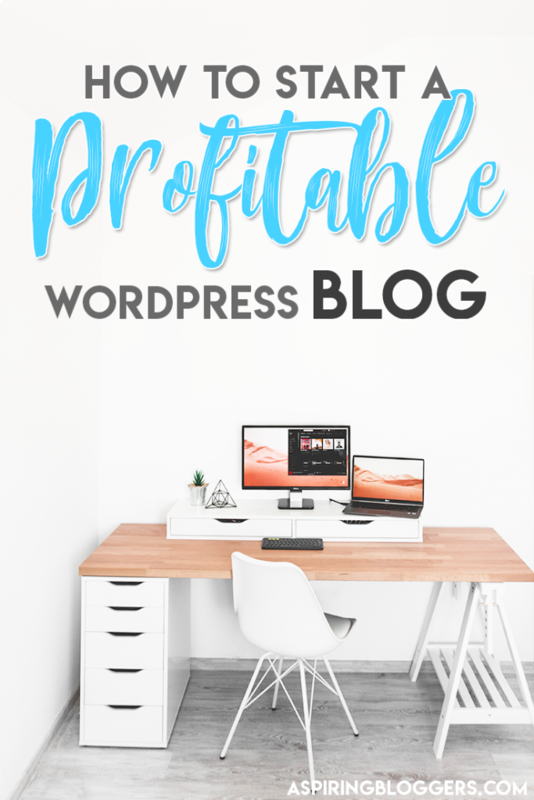 Congrats, you’ve just created the foundation for a profitable blog! 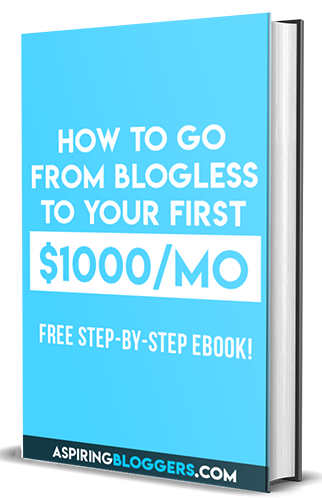 The next few steps will help you grow and monetize your blog. Email lists are something every blogger should have. By collecting emails of readers that visit your blog, it unlocks a ton of different opportunities such as the option to send them your latest blog posts, or information about products and services you sell. It’s easy to start an email list! Follow this tutorial to create yours. 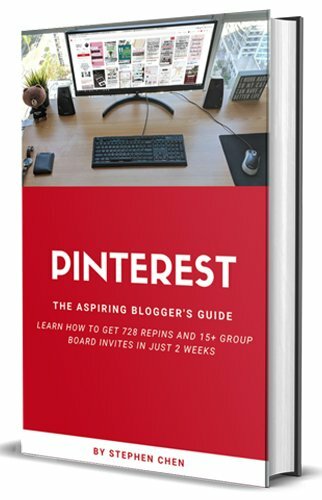 You’ve probably come across blogs that show ads for various businesses. These blogs are partnered with “Ad Programs” and the blog owner generates income every time one of those ads are clicked. Essentially, if you’re partnered with an ad program, you’ll be paid to help other businesses advertise. The more clicks you get, the higher your ad income will be. The type of ad that’s clicked will also determine how much you earn because some industries are more competitive and companies will have to pay more to advertise on ad networks. High traffic blogs can make a lot of money through ad revenue. Popular blogs will make full-time blog income from ads alone! Apply for Google Adsense when you first start out. It’s a popular ad platform for new bloggers. When you reach 25,000 site sessions per 30 days, apply to mediavine! Their ads pay much more than Google Adsense ads. When you hit 100,000 page views per 30 days, apply for Adthrive. In my opinion, they’re the best ad platform for bloggers who are generating tons of traffic! Affiliate marketing is the process of promoting another brand’s products through affiliate links. When you get approved for an affiliate program, you’ll be provided with”affiliate links” that you can place anywhere on your blog. If a reader clicks on that link and purchases the product, you’ll earn a commission for your referral. There are thousands of affiliate programs for different brands or companies out there and Shareasale.com lets you sign up for a lot of them. Siteground – the web host you signed up with earlier! They pay up to $125 per referral depending on how many referrals you make. Amazon Associates – advertise any Amazon product on your site and get a percentage of all sales you refer to them! Try promoting your affiliate links inside your blog posts, on your sidebar, in your footer, or even as a link in your menu bar. It’s simple. Inside Blog Posts: Copy the affiliate link and then in WordPress, you can highlight the text you want to embed a link into, and press CTRL + V to paste it in. The text will change color, indicating that the text is now hyperlinked! On Sidebars and Footers: In WordPress, go to Appearance > Widgets and add the affiliate link there via a text box. In Your Menu: In WordPress, go to Appearance > Menus and add a custom link to any of your menus. Where it says URL, insert your affiliate link. Items that you can sell and ship to your readers. If you have an amazing product that you think your readers will buy, you can add them to your store! You don’t even need a physical store. Just use your home as a warehouse for your own products. Digital items that you can sell and not have to ship. You can choose to create and sell digital products on your blog for passive income! This includes things like guides, printables, design templates, calendars, worksheets, checklists, and stock photos. Digital products is one of highest sources of income for many full-time bloggers. It’s easy to create something useful and sell it online if you create the right product for the right audience. Labor work that you can charge your readers for if you’re exceptionally good at something. What you charge depends on what you’re worth and what your readers are willing to pay. Types of services: Coaching, Consulting, or anything Freelance! As an example, I offer web design and consulting services on my blog to earn extra income! If you’re a fitness blogger, you can do online coaching or consultations for your clients!